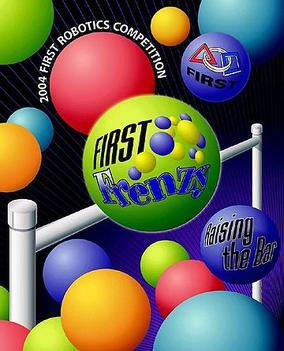 FIRST® FRENZY: RAISING THE BAR was played by two alliances of two teams each. The goal was to score balls dropped from on top of the player station into one of two movable goals. Robots scored bonus points by elevating themselves off the floor by grabbing onto a 10′ high steel bar in the middle of the field. The Clawbot had a very unique drive train compared to other years. The bot had a 8 wheel drive, six of which didn’t touch the ground making them pneumatic. The robot had 8″ main helper wheels which got them around. The robot also had a chassis which allowed for a rapid swap of the wheel modules. Clawbot featured a spring activated Wing mechanism, which used a Teflon sheet and contacted balls to herd them. Clawbot also, relating to it’s name, had a claw and arm which used a lead screw to open and close, and a Van Door motor to rotate up and down. There is also a story involving Clawbot which is very unique. This game, as listed above, featured a high bar which you could get bonus points for hanging on. There was an integrated arm that would hold a 2x multiplier ball and hang on the robot. In order to hang on the bar, the arm would extend and hooks would hang the robot on the bar, and a winch would than pull up the robot. At the Mini-Regional, the team tested the arm, only to find out that the hooks wouldn’t hold the robot up, and the arm broke. Devastated, they went back to the garage to find that a popped ball had just the right stickiness to hang on the bar, which meant that we had a VERY unique hanging mechanism to other teams. 2004 was the first year Charger Robotics got to Nationals on their own steam. We qualified for Championships by being regional champions at the St. Louis Regional. We also won the Autodesk Visualization Award and the Woodie Flowers Award (Awarded to John Budish).